It was a white winter wedding on a wonderful day. There was fresh snow coating the soft ground. Douglas fir boughs appeared in the air. And twinkle lights and candles shone everywhere. It was a white winter wedding to remember. The Alpental Ski Facility, which is a part of the Summit at Snoqualmie ski area, made for some charming and unique winter wedding photography on a crisp November day. I've spent many hours ripping the backcountry here and never would have imagined Alpental wedding photography could be so beautiful. Nestled within the Mt. 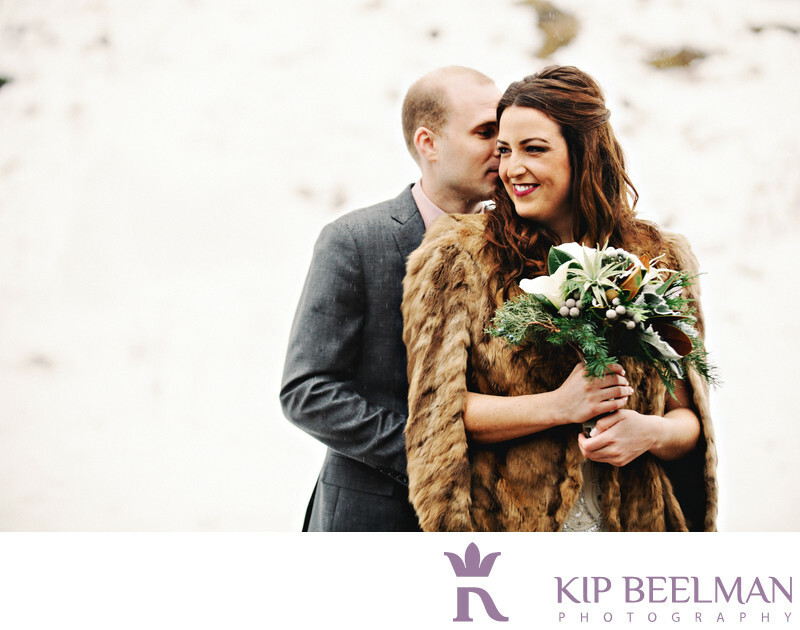 Baker-Snoqualmie National Forest in Snoqualmie, Washington, the bride wore a beautiful vintage beaded dress and a fur shrug and a smile that tells a story. She clasped onto her winter bouquet and her visions for today and tomorrow. The groom then huddled in for warmth and a kiss (and perhaps a shared secret). Regardless of the day’s temperature, they remained warm from the inside out. The intimate wedding party and guests all celebrated the duo in lodge style, including some warming shots and rounds of cheers for the couple. Everyone soaked up some fresh mountain air, some majestic views of a lifetime, some atmosphere and the splendor of the season. A raucous photo booth, which was provided by The Lightning Booth, included an amazing custom backdrop that was crafted by Sara at Pinyadayada. The final season of the year can provide a stunning back drop for memorable outdoor wedding photography as well as a reason to celebrate the coming of winter for years and years to follow. Location: 1001 Route 906, Snoqualmie Pass, WA 98068. Keywords: Mountain Wedding (6), Snoqualmie Pass (3), Winter Wedding (3).